It should come as noÂ surpriseÂ to our regular readers that I’m a big fan of incase products, specifically the incase slider. I first bought one of the cases a few years ago, and the day I bought my 3GS, I picked up a matching case for it as well. The matte finish appeals to me more than the glossy tone of the iPhone itself, and it also wears well. Although I didn’t dock my 3GS very often, it was nice to know that when I did, I just had to remove the bottom of the case instead of the whole thing. 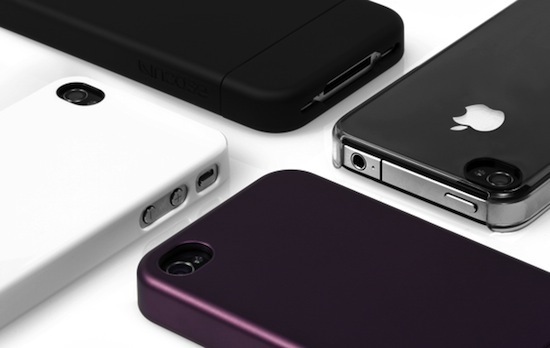 Now, the popular case – as well as it’s cousin, the Snap – is available for the iPhone 4. TheÂ Slider Case is available now for $34.95 in Black. The Metallic cases in Dark Mauve, Gunmetal and Raspberry will be available in the weeks following, with Dark Mauve shipping the week of 8/16, and Gunmetal and Raspberry shipping the week of 8/23. Additionally, the Slider Case in White will ship the week of 8/23. TheÂ Snap Case is $34.95. Clear will ship starting the week of 8/9, Black Frost will ship starting the week of 8/16. So there you have it. New cases from incase for your iPhone 4. I’ll be ordering my black one shortly. A couple of these cases are available for free through the iPhone 4 free case app.